It was just a dream, it was just a dream. I kept telling myself it was just a dream. For those of you who don’t know the term, I can only describe it as being unable to move while being attacked by the scariest monster you could ever imagine. My first encounter with this dark force of night was when I was 25 years old, nearly 15 years ago. I had just suffered a breakup with someone who I thought I was going to spend my forever with. It was one of those life altering, devastating break ups that you never get over. Loss of appetite, anxiety, crying fits, deep depression and sleepless nights ensued. After several days of laying awake through the night, I collapsed in my bed into long awaited sleep. And that’s when IT happened. Suddenly in the dark of night I was awake, but couldn’t move. My eyes seemed welded shut-at least the eyes of my physical being. Somehow, I could see outside myself. I could see both above myself and behind myself at the same time. And that’s also when the devil came into my room. This dark being with the form of a human but with a monsters face. It was black, all black with wet, slimy skin. It’s physique was thin and gaunt, almost skeletal. His eyes white, his teeth long and sharp, and his mouth drooling like something from a horror movie. First he was standing near my closet. I could sense his presence long before I could see him. Unable to move, unable to scream, unable to run away. I was locked there, frozen onto my mattress with my heart racing. Then, he was laying behind me. His face inches away from the back of my head, growling. I was above myself looking down but also able to see behind my head at the same time. The presence was heavy, evil and malicious. Unable to move my mouth I mentally recited prayers to myself. I’m not an overly religious person but the fear was that imminent and real that I tried anything in desperation to protect myself. I tried my hardest to will a finger or arm to move. If I could just wiggle a pinky finger I could break the spell. After what felt like an hour of struggle, I began to slowly sink into the mattress. The feeling that I was going to suffocate in the depths of my mattress was overwhelming.The creature stared at me and growled. It’s pupils black and the whites of its eyes extraordinarily bright watching as I was being swallowed by my Sealy mattress. Suddenly my efforts paid off. A hand was able to move, i jolted myself awake. I laid there stunned- and then quickly went back into slumber. I didn’t fully recall the horror until the morning. I was in disbelief and rattled. Everything that played out the night before remained so vivid to me, which is not typical of my dreams which are always fuzzy on detail and quickly forgotten if I don’t record them. I questioned my sanity. I questioned the possibility of an evil force following me. I checked my closets and locked my windows, even though it was a stifling hot early August night. And then the same scenario played out again. It was the next morning, in my office where I was too distracted and scared to be productive that I googled “ Satan bedroom sleep paralyzed”. There I found a treasure trove of online forums and chat rooms describing my very encounter. I found solace in the hundreds of other people discussing their similar terrifying encounters. It had a name. 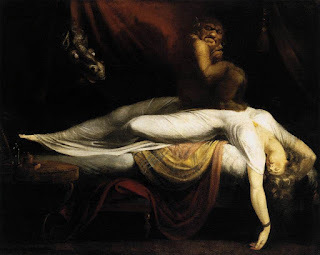 Sleep paralysis. Stay tuned for future posts where we discuss this night time disorder and talk more about our own experiences.